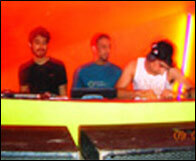 Rock & Jazz Nites At Firangi is an event that took place on 05-Nov-2007 in Hyderabad. The only way to look forward to a Monday is ...actually, none. Still, some jazz and some free booze should help cope. It rocked Bangalore, and now it's in Hyderabad. Firangi Paani, recently opened at the City Centre Mall on Road No. 1, Banjara Hills, is the latest entrant to the nightlife of Hyderabad (or whatever). And when it's Monday, get set to rock with jazz here. The in-house DJ Rocky will be your host, spinning some soft rock, jazz, blues and commercial rock. So what better way to start the week than rocking? There are cover charges of just Rs. 400 and above, which are redeemable against drinks. There are also happy house, between 4:00pm and 8:00pm, during which you will get a complimentary drink with every drink that you order. This offer is applicable only on Indian spirits. For further details, please contact the pub at 6657-0000. Be the first to comment on Rock & Jazz Nites At Firangi! Just use the simple form below. fullhyd.com has 700,000+ monthly visits. Tell Hyderabad what you feel about Rock & Jazz Nites At Firangi!